Magnum P.I. Goes to war Against Japan! I remember watching this on TV, USA’s Magnum, P.I . – Doppelganger, Don Frye- up against a giant of a man Yoshiro Takayama and an epic battle began, never- have I seen any fight like this and don’t think I ever will, I think originally this lasted 6 minutes but an epic battle, and tremendous punches that would stop a truck. 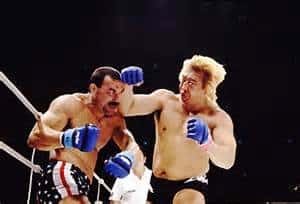 Don Frye Must be the toughest man in the world- he took some huge shots from the Behemoth of a mountain and pushed forward, not giving up and continued to take the barrage of punches and won through with flying colors. Yoshiro’s face was a puffed up as marshmallow and took a brutal beating. No matter how high the Battle may seem to you in life, if you can swallow your pride and get your head down and give it your best until you cannot stand, then you will always come through to the finish. And this Video ” Albeit Brutal ” is testament to that. I just wanted to share this as my Mid week thought of the day! This entry was posted in Blog and tagged bonneville, BSA, build a bike, cafe racer, Honda, magnum P.I. Yoshiro Takayama, mixed martial Arts, motovation, never give up, thruxton, triumph.